There are over $140 million in unobligated funds for the Knik Arm Bridge stashed away in past capital budgets that are now in play. Those federal and state funds can pay for approximately $275 million in transportation projects this construction season (state funds get an approximately 10:1 federal:state match). It’s time for the legislature to take those funds away from the KAC boondoggle and reassign them to this year’s capital budget for transportation projects. Significant media activity in the past two weeks in response to the TIFIA rejection letter of 2/09/2016. Very strong opinion piece by Dermot Cole at the Alaska Dispatch News. OR view an archived copy here (PDF 119kb). On Feb 9, 2016 the US Department of Transportation turned down a Letter of Interest loan application for a $378 million TIFIA loan and $15 M TIGER grant. (See TIFIA letter here). By the terms of the passed KABATA Bill HB 23, the necessary state bonding for the project was contingent upon receipt of a low cost 3.5 % federal loan with no interest payments for five years for one third of the project costs. This is at least the seventh TIFIA application KABATA/DOT has submitted and it has yet to advance past the letter of interest initial review stage. 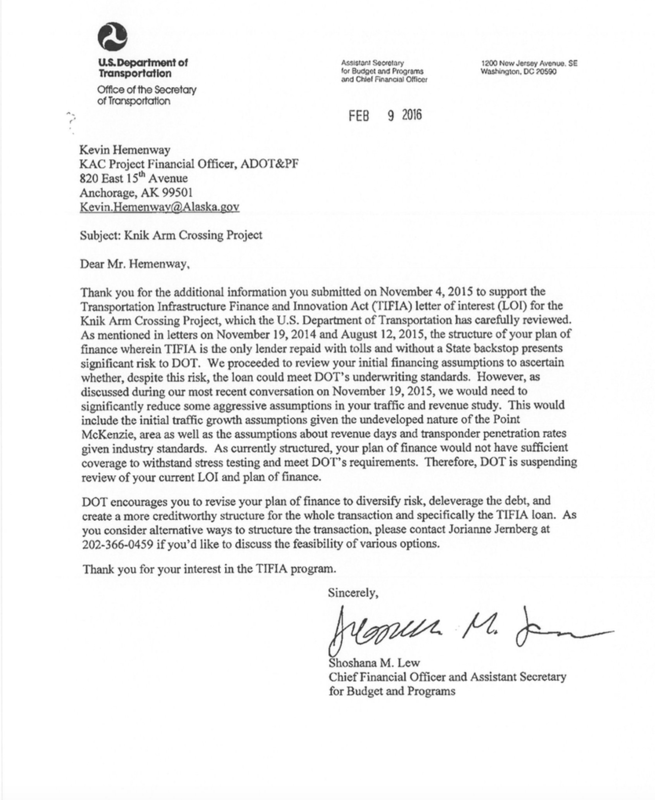 In its review of the KABATA/DOT application, TIFIA CFO Shoshana Lew cited “aggressive assumptions in your traffic and revenue study” in informing KABATA/DOT project financial officer Kevin Hemenway that TIFIA is “suspending review” of the application since the application could not meet “(US)DOT underwriting standards.” Many of the aggressive population and traffic count assumptions cited by TIFIA were documented in the 10/13/15 post below and are familiar to readers of this blog over the past five years. Per the state checkbook, in the past three years, KABATA/DOT has directed at least $2,242,636.04 to two major contractors for the new numbers – which TIFIA has now rejected: CDM Smith of California (the same traffic and revenue consultant criticized in the 2013 LB&A Audit of the project) and Cardno, Inc. of Portland, Oregon. A copy of the press release from Scott Goldsmith and Jamie Kenworthy is available here. Some legislators may find the timing on the delayed release of the loan rejection news to be curious. The TIFIA rejection letter to Kevin Hemenway was dated February 9, 2016. On February 16 Government Hill Community Council President Stephanie Kesler requested from the Director of the Knik Arm Crossing Project, all recent correspondence from TIFIA to KABATA/DOT. On March 9th, the Director made the February 9 letter available to Kesler. Both houses of the legislature have now passed their version of the DOT operating budget for next year and the two versions sit in Conference Committee. The capital budget has yet to pass either house and the Department of Transportation lacks the 9% matching funds necessary to use all the federal funds available on July 1, 2016. So, the big question is: Will legislators keep their $168 million commitment to the bridge that now has no finance plan or will those funds be made available to fund additional projects and increase jobs this construction season? Walking back his January, 2015 decision [Online at Juneau Empire OR archived copy here]. (PDF 70kb) to halt spending on the megaprojects of the Juneau Road, Susitna Dam, and the Knik Arm Bridge, Governor Walker in July amended his earlier administrative order to allow further spending on the projects (see here at ADN OR archived copy here. (PDF 111kb) and here at ADN OR archived copy here. PDF 106kb) for details). The Governor’s decision allows the Knik Arm Bridge and Toll Authority (KABATA) project team (now housed in the Alaska Department of Transportation and Public Facilities (AKDOT) to apply for a $378 M federal TIFIA loan and a $15 M federal TIGER grant that could launch what AKDOT estimates is a $1.15 Billion project. If the federal money is acquired, 2014 Legislation allows the project to move forward requiring only the approval of the state’s bond committee. Click here [ Dead link- the KABATA website is no longer online ]. for the AKDOT/KABATA project letter of interest application. Knik Arm Crossing proponents state that Toll Revenues will be enough to pay back the TIFIA Loan. They also predict that toll revenues will eventually be high enough to make the State-Issued Bonds payments (although AKDOT/KABATA does admit that initially, the state will need cover the bond payments). In stark contrast, we believe that analysis shows that toll revenues will be approximately only one quarter of the revenues predicted by AKDOT/KABATA. With just one quarter of the estimated tolls coming in, the Knik Arm Bridge will require annual subsidies from the State of Alaska to pay for: Operations & Maintenance, TIFIA loan payments, and servicing of the State-issued Bonds. The Knik Arm Bridge traffic estimates performed for the Wasilla Bypass project were predicted to be 9,000 Average Daily Trips (ADT) in 2035, versus 36,000 ADT predicted by AKDOT/KABATA. 9,000 average trips is one quarter of AKDOT’s/KABATA’s estimate and is also what we predict. AKDOT’s/KABATA’s population forecasts for the Point MacKenzie area are 80% higher than forecasts performed for AKDOT’s Wasilla Bypass project. AKDOT’s/KABATA’s population estimates rely on growth assumptions that have not yet occurred in the Mat-Su Borough, and that will significantly raise taxes and raise the price of housing in the Point MacKenzie area. AKDOT’s/KABATA’s previous population and employment predictions used wildly different assumptions than their current “model”. AKDOT’s/KABATA’s financial plan still relies on toll revenues from traffic volumes than can only be accommodated by a 4-lane bridge. But the costs in the financial plan reflect the only the costs of building a 2-lane bridge. Whether the state can pay off the proposed federal TIFIA and TIGER loans and $287 M in state bonds needed to finance the project, depends largely on how many people live near the Bridge and are willing to pay a one-way $5 toll (rising 2.5% a year). The population estimates performed by AKDOT/KABATA [ Dead link- the KABATA website is no longer online ].consultants included in the federal application, is for 207,888 people in the Mat Su Borough in 2040. (p. 25 ). Again, in stark contrast, Eddie Hunsinger, the Alaska state demographer, in April 2014, projected 166,338 people in the Borough in 2042. Also, the Anchorage Metropolitan Transportation Solutions (AMATS) adopted a 2040 population estimate of 155,000 from a McDowell report to be used for the upcoming Anchorage transportation plan. With about 98,000 people in the Mat Su Borough today, the population figure used for the federal loan application projects over 60% higher growth rate in the Borough in 2040 than either the state demographer or AMATS. Click here for visuals developed by ISER’s Scott Goldsmith and Jamie Kenworthy illustrate the large differences between the Bridge proponent’s population number and other sources. Neither the state’s official population projection nor the AMATS projection was provided to the federal TIFIA loan officials by AKDOT/KABATA. However the application included a “poster [ Sadly, this is a Dead link- the KABATA website is no longer online].,” of a “vision” of proposed “townsites” near the Bridge from a February 2014 study paid for by the Mat Su Borough. The disclaimer included on that poster states: “This map illustrates a futuristic concept to be used for discussion and generalized planning purposes only.” The poster indicates the difficulty that AKDOT/KABATA has in getting the population density that they need, using the lot sizes that are typical for the Borough. Outside of the Palmer/Wasilla core area, almost all of the Mat-Su Borough has been and is being developed using well and septic systems that require a minimum 1 acre lot size. To pack enough people near the Kink Arm Bridge (where it actually might make financial sense to pay a toll instead of using the free Glenn Highway), AKDOT/KABATA is instead predicting that the vast majority of new homes being built will have 2, 3 or even 5 dwellings per acre. There was some additional capacity built into the water treatment plant and sewage treatment plant for the Goose Creek Correctional Center, but it is clear that the available capacity would not be enough to support what is envisioned at the Point MacKenzie townsite. The poster also indicates that the Mat-Su Borough and the state (along with private developers) would be responsible for the costs of building additional roads, schools, water treatment and sewer plants necessary to support the population density projected by AKDOT/KABATA. Since the Mat-Su Borough has struggled to pay for updating their current sewage treatment plants, it is highly unlikely that Mat-Su voters will authorize the tax increases to pay for the 6 or 7 new water and sewer treatment plants needed for this “futuristic concept” to come true! Unfortunately for AKDOT/KABATA, those small lots and higher costs take away the major reasons people move to the Mat-Su Borough, cheaper housing costs, and a bigger piece of land to call your own. The need for new schools (Fire & Police Stations also) out on Point MacKenzie well before there is enough population to fill those schools will result in higher taxes in the Mat-Su Borough, further dampening growth rates. AKDOT’s/KABATA’s Consultants “tweak” assumptions to create requisite cash flow – The Tail Wags the Dog. We have previously pointed out the number of wildly different scenarios that AKDOT/KABATA and their consultants have created over the years to pump up needed toll revenues. For example: In 2012, we identified a striking inconsistencies in KABATA’s job predictions The estimate of the jobs in 2035 in the same two Traffic Analysis Zones (TAZ) on the Mat-Su side of the Bridge, was 13,828 in their 2011 prediction, but only 6,740 jobs in their 2007 prediction. And there was no explanation of the difference. So where did that inexplicable doubling of jobs come from between 2007 and 2011? In 2007, KABATA forecasted Mat-Su’s 2030 population at 250,700? But in 2011 they forecasted the population at 200,000 in 2035 – a decrease of 5,000 even with an extra five years. So, with less population, but still needing to show high traffic counts, it appears that KABATA’s 2011 forecast manufactured a doubling of jobs at Point MacKenzie in order to justify both north and south bound traffic crossing the bridge. Assuming that there will be high levels of 2 way-traffic to “go to work” and go shopping at a massive mall and or to go to work at a huge new business center, was clearly an attempt to justify their predicted high toll revenues. The 2007 job estimates even included a Mall 2.4 times the size of the Dimond Center. It is likely that reality will look different, because those same two TAZ zones are in the area at Point MacKenzie currently set aside for heavy industrial use. Those millions of square feet of retail shopping areas are completely incompatible with the Point MacKenzie industrial Special Use District (SPUD) that the Mat-Su Borough established in 2011. That SPUD plan outlines land use consistent with the Pt. Mac Bulk Commodities Port: mineral and forest products processing, a petrochemical plant, metal fabrication for oil and gas modules, laydown yards to store pipe for the gas pipeline, power generation and other manufacturing industries. A possible liquefied natural gas (LNG) plant, coal loading, and tank farms are also proposed uses clustered adjacent to the Port. Clearly, homes and major business or retail areas should not be built directly adjacent to hazardous industries like 7 million gallon tank farms, LNG plants or coal loading/storage facilities. Since KABATA’s 2014 socio-economic consultant showed a new population of nearly 7000 people in what the SW Borough Futures poster show as the Port MacKenzie Port Industrial Area (i.e. zero population), it shows that KABATA’s consultant understood the toll revenue need for a higher population near the Bridge, and assumed that the current Mat-Su Borough regulations on the Port MacKenzie Special Use District (and common sense) would be overturned to allow residential use adjacent to hazardous industrial uses. For the entire Port MacKenzie area, AKDOT/KABATA’s consultant is showing over 5 times the population that AKDOT estimated for the Wasilla Bypass project (see discussion below). Whether it was big Borough populations in 2007, big retail in 2007, massive business/retail in 2011, or “futuristic” townsites and putting homes and businesses in industrial areas in 2014, it is clear that AKDOT/KABATA’s consultants continue to manipulate the numbers to generate the cash flow predictions needed to cover loan and bond payments. A “Fresh Start”? Or still getting predictions that don’t pass the “Smell Test”? A review of the state checkbook reveals that KABATA and AKDOT spent over $1.3 Million in the last two years on new studies by their consultants Agnew:Beck, Cardno, Inc, and CDM Smith. Agnew:Beck and Cardno, Inc of Portland, Oregon produced new population and employment forecasts which were the inputs to CDM Smith’s new traffic and toll revenue estimates. CDM Smith is the traffic and toll estimating firm that was criticized in the 2013 Legislative Budget and Audit for “undocumented” and “overly optimistic” assumptions that led KABATA to promise a “fresh start” on new numbers. In 2014, CDM Smith estimated that there would be an average of 40,700 trips a day on the bridge in 2040. That number is essentially equivalent to the 36,000 trips a day CDM Smith projected for 2035 in 2012. (In analyzing the proposed Wasilla Bypass, HDR Inc. projected only 9,400 trips a day bridge in 2035 even though HDR also had a high number for Borough growth; their 188,000 people in 2035 is consistent with KABATA’s 208,000 in 2040.) Because Mat Su’s annual population growth has slowed down to 2.3% a year since the 2010 Census, a skeptic might suggest that KABATA’s continued persistence in showing much higher population, trip and toll forecasts compared than all other sources is driven by KABATA’s continuing need to show enough revenue to cover expected Bridge obligations. 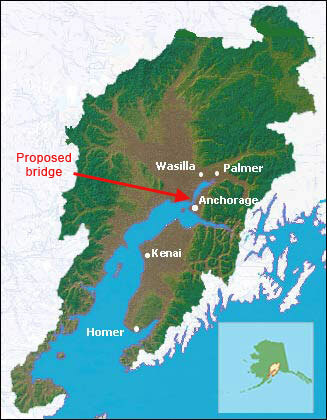 To project enough toll revenue to pay off proposed Bridge obligations requires both a high future Mat Su population and job growth and also requires that much of that growth will not be in the Borough’s current Palmer-Wasilla core but rather moved southwest to Pt MacKenzie at the proposed northern terminus of the bridge. KABATA’s consultant HDR is in a unique position of creating socio-economic predictions for other AKDOT projects. HDR’s socio-economic predictions for those other AKDOT projects are in conflict with the predictions by Cardno / Agnew::Beck for AKDOT/KABATA. 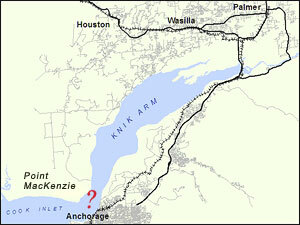 HDR put only 7,177 people at Pt MacKenzie in 2040; the AKDOT/KABATA number is over 5 times higher or 37,074 people. AKDOT/KABATA also projected twice the number of jobs in 2040 than HDR at Pt Mac: 8,930 jobs vs. 4,511. A 37,074 population at Point MacKenzie in 2040 (compared to only about 1,700 there today) would make Point MacKenzie the state’s second largest city, if Juneau and Fairbanks don’t grow much larger than their 31,000 residents each today. Scott Goldsmith and Jamie Kenworthy took the local neighborhood (or Traffic Analysis Zone (TAZ) in transportation parlance) job and population estimates, and broke them into local regions to graphically illustrate the major differences between the Borough’s official transportation plan done by HDR and the numbers AKDOT/KABATA provided in their federal TIFIA “Letter of Interest” loan application. The numbers dramatically differ on where people will live and work in the future Borough between the numbers provided by DOT to the feds and the Borough’s officially adopted transportation plan. Click here for population distribution (PDF 3.5MB) and here for location of jobs (PDF 3.6MB). In 2013, we provided testimony to the Legislature pointing out that KABATA was counting on toll revenues from traffic that can only fit on a 4-lane bridge, while showing costs of financing and constructing only a 2-lane bridge. Those 4 years of “Impossibly Derived Revenue” are what we call the “2-lane cost/4-lane revenue” problem with KABATA’s past and current financial schemes. AKDOT/KABATA Project Leader Judy Dougherty has testified that traffic volumes greater than 20,000 ADT will result in congestion. The 2015 Knik Arm Crossing TIFIA applications included an effort by CDM Smith to respond to our criticism, and to calculate just how much that “congestion” will affect traffic volumes, but the application still relies on unusual assumptions that are clearly not based on reality: reference pages 5-13 and 5-14 and Table 5-10 in CDM Smith’s 12/5/14 Toll and Revenue report [ Dead link- the KABATA website is no longer online ]. For the hours ending at 7, 8 and 9 am, there were 2,352, 1,903 & 1,370 average hourly flows (both directions), and 1,928, 2,619 & 2,721 for the hours ending at 4, 5 & 6 pm. That average hourly traffic did not exceed 1,400 vehicles per hour for the remainder of the morning and afternoon, up until the evening “rush hour”. Compare those actual traffic patterns on a 4-lane highway to AKDOT/KABATA’s predictions that “Traffic volumes increase to the maximum flow rate (2,500 vehicles/hour) early in the morning and stay at that level throughout the day” on a 2-lane bridge. Commuters already complain about “rush hour” traffic on the 4-6-lane Glenn Highway at average hourly vehicle counts that are close to, or less than the vehicle counts that AKDOT/KABATA predicts will be able to fit on a 2-lane bridge! Not only is CDM Smith’s predicted traffic pattern NOT based on “the time of day pattern of traffic counted on the Glenn Highway”, the idea that their 2-lane bridge can sustain 2,500 vehicles per hour at any time is highly questionable. Interestingly, the 29,386 ADT from 2008 Glenn Highway Traffic patterns are still basically representative of Glenn Highway Traffic today. The ADT at the Eklutna Flats measuring station has stayed at approximately 30,0000 ADT for the past 5 years. Clearly the Mat-Su Borough is developing its own jobs, reducing the bedroom community patterns of the past. The Alaska Division of Commerce backs up that information with statistics showing that the percentage of Mat-Su residents commuting outside of the Borough for work (including the North Slope, etc) dropped from 55% in 2011 to 44% in 2015. Table 5-10 on page 5-14 of CDM Smith’s 2014 Traffic & Revenue forecast indicates that even with the “constraints on the hourly flow rates”, their revenue forecast still asserts that they can have 33,300 average daily traffic fitting on a 2-lane bridge in 2045, which is clearly not possible. Furthermore, at 25,000 vehicles a day, if you use the 2008 hourly traffic rates measured on the Glenn Highway to estimate the hourly rates on the Knik Arm Bridge, there would be so many cars trying to use the bridge during “rush hour” that traffic would backup more than a mile on either side of the bridge. At 33,300 ADT there could be 6 mile backups in the morning and evening peak hours. The AKDOT/KABATA paid over a million dollars for the CDM Smith report and those Toll Revenues form the basis for their 2015 TIFIA finance plan [ Dead link- the KABATA website is no longer online ]. The peak-non-peak flow in Anchorage shows the toll revenue projected over about 20,000 ADT is physically impossible. CDM Smith’s prediction that “Traffic volumes increase to the maximum flow rate early in the morning and stay at that level throughout the day” is a wholesale invention of a new traffic pattern for Anchorage where peak hours and non-peak hours have almost the same level of traffic and congestion. The statement from the Citi financial plan pg. 3 sent to TIFIA, “Toll Revenue for Phase I is capped at the facility capacity and only grows by inflation adjustment to toll rates from when that point is achieved” is demonstrably untrue, since the revenue estimates come from CDM Smith Table 5-10 where up to 33,300 vehicles a day cross a 2 lane bridge that has a capacity of only 20,000 ADT. KABATA has been turned down for a TIFIA loan seven times at the preliminary “Letter of Interest” stage. However when the legislature passed HB 23 in 2013, it changed the financial structure from a public private partnership to a direct state finance structure. And it added language [archived copy here] (37.15.260 1 g ) to have the Revenue Commissioner report annually to the legislature, stating the amount of money that will need to be appropriated to cover all Bridge obligations. That requirement is considered by bond attorneys to trigger a “moral obligation” of the state to cover all toll shortfalls. In that scenario, the legislature would have a tough choice each session: appropriate enough funds to cover all bridge obligations or trigger a default by a state department and risk an almost certain downgrade to Alaska’s Credit Rating. With the expected toll shortfall apparently guaranteed by a state that for now has a AAA credit rating, TIFIA loan examiners may not care how accurate AKDOT/KABATA’s population and toll revenue projections are since the state is essentially on the hook as the backup creditor. All of AKDOT’s/KABATA;s cost estimates have been based on a design that is only 35% complete. As that design works towards being 100% complete, the cost increases that are “normal” for a mega project of this scale (along with the toll shortfalls) means that IF the Kink Arm Bridge is built, Alaska could easily be looking a $2 billion hit to the State Budget. TIFIA has told Congress that existing appropriations allow about $9 billion a year of project financing that covers up to one third project costs or TIFIA funds can launch about $27 billion of projects a year. A review of current letter of interest applications [archived copy here.] shows there may be too few projects chasing too much money. So the “Bridge to Nowhere” could have a fair chance of passing the letter of interest phase and moving to the credit analysis phase that often leads to loan approval. Aides to the Governor have assured this blog’s writers that the Knik Arm Crossing, like the Juneau Road and Susitna Dam, is in a “parking lot” awaiting consideration only by future administrations. But the Transportation Commissioner’s endorsement of the project [ Dead link- the KABATA website is no longer online ] and the active status of the TIFIA loan request sends a different signal. The question for Alaska is: IF the TIFIA loan is acquired, can Alaska afford to spend $2 Billion on a bridge to nowhere in an era of $5 billion dollar deficits? The flurry of activity around the Knik Bridge project in the last two months has made two things clear: First, the Governor Walker appears serious about taking the Bridge out of his capital budget request; he ordered the Department of Transportation and Public Facilities (DOT) stop spending funds on the project. Second, despite attempted resistance from the Department, Walker remains in charge. With oil below $50 a barrel, the Governor’s first step to getting control of an approximate $3.5-4 billion state annual deficit came on December 26, 2014 when the new Governor issued Administrative Order 271 OR archived copy here. to stop spending non-obligated and unencumbered funds on six megaprojects. Besides the Knik Arm Crossing, the other projects were the Ambler Road, the Juneau Access Road, the Susitna-Watana Dam, the Kodiak Launch Complex and the Alaska Stand Alone Pipeline project. See here for Governor Walker’s press release [ Dead link- the document is no longer online ]. A January 5, 2015 memo - OR archived copy here - from holdover DOT Commissioner Kemp to Governor Walker’s new Office of Management and Budget Director, Pat Pitney with a copy to the Governor’s Chief of Staff, Jim Whitaker boldly defended his department’s projects. Kemp argued that both the Juneau Road and Knik Bridge were “long-standing goals of the state” that represented a “cost-effective opportunity.” He also said canceling both projects would “likely trigger” the requirement to repay the estimated $73 million in federal funds spent on the Knik Bridge and the $25 million in federal funds spent on the Juneau Access project. By arguing that the Knik Bridge could be funded by state and federal bonds and user fees, Commissioner Kemp was, in effect, backing up the controversially optimistic toll revenue forecast and implying the Bridge would have no impact on the state’s budget. The resistance of DOT bureaucracy to the apparent cancellation of the two projects stood out among the other state departments and agencies reacting to the suspended six megaprojects. Critics of Commissioner Kemp’s reasoning were not long in coming out.- OR archived copy here. With DOT’s estimated cost of the Bridge at $1 Billion (critics say around $2 Billion), bridge critic Jamie Kenworthy said the mathematical logic of Kemp’s reasoning was that if you had put five cents into a project that did not make sense, should the other 95 cents follow? Others pointed out when costs ballooned on Anchorage’s Highway to Highway and the Knowles Coastal Trail extension projects, both were canceled by the state and FHWA without the state having to repay the federal funds expended. Faced with these past examples, DOT Transportation spokesperson Jeremy Woodrow backed off his earlier claim that refunding would be required, and instead admitted that past repayment issues had been settled on a case by case basis. The Subway Eminent Domain Fiasco: A DOT Left Hand/Right Hand Problem or an Out of Control Bureaucracy? On January 8, 2015, DOT contractor HDR notified the owners of the Subway business on Government Hill threatening that if ”there is not some form of mutual agreement reached between the parties within 14 days” regarding acquiring of their property lease for Bridge right of way, the case would be referred to the Attorney General for instigation of eminent domain proceeding to acquire Subway’s interests in the property. The HDR letter copied Knik Bridge Director Judy Dougherty and the Attorney General’s Office. The willingness of DOT to incur further legal and right of way costs appeared to contradict both the Governor’s December Administrative Order 271 to halt further un-obligated spending and the Knik Arm Crossing and Toll Authority’s (KABATA’s) November 14, 2013 Board resolution - OR archived copy here - to let existing businesses operate until the project’s plans were nailed down. It’s not clear whether DOT leadership, including Central Region Director Rob Campbell, knew that Knik Arm Crossing Director Judy Dougherty was continuing steps to take to acquire property. But the Governor reacted by canceling any further efforts to acquire more right of way, remarking “let’s not go and start tearing down buildings and closing businesses” - OR archived copy here - for the hypothetical project. It is not known if the Tesoro Station on Government Hill received a similar eminent domain letter from DOT, as their property is also slated for demolition, should the Knik Bridge pass their financial and permitting hurdles. Government Hill Community Council President Stephanie Kesler applauded the Governor’s decision to cancel the eminent domain proceedings while pointing out that DOT had still not canceled the contract to demolish two private homes and the Sourdough Motel. She asked that the DOT employees who ignored the Governor’s administrative order be held accountable. Senator Ellis (D-Anc) described the attempted taking of two operating business as a continuation of the Department’s “pattern of intimidation” of the neighborhood and Bridge opponents - OR archived copy here. Summary: New Sheriff in Town and New Commissioner, but old legislature? On January 23 the Governor announced [ Dead link- this document is no longer online ]that he had appointed former DOT Commissioner Marc Luiken to his former post- OR archived copy here. A former Elmendorf Vice Commander, Luiken reportedly had been fired by Governor Parnell after he had quantified the budget needed just to maintain DOT’s transportation infrastructure and argued for the priority of maintenance over new construction. While he had never publicly aired his differences with the Governor and his transportation aide Randy Ruaro, reports had circulated from aides that the Governor asked for Luiken’s resignation when it became clear that Commissioner Luiken did not share the Governor’s support for the megaprojects that had drawn such enthusiasm from the Associated General Contractors and local politicians, and particularly from the Mat-Su Borough. On January 9, 2015, DOT proposed Amendment 13 to the Statewide Transportation Plan (STIP) that would drop the Knik Arm Crossing from the STIP, and transfer those funds to other projects, taking the necessary bureaucratic step of asking for public comment by February 13 on the proposed amendment. With these actions by the Governor and the Department of Transportation, it has become clear that the Governor is focused on cutting the capital budget and a Commissioner is now in place who shares the new Governor’s priorities. But it is not clear whether the legislature will go along with the Governor’s priorities. On January 22, 2015 the joint Senate and House Transportation Committees met to hear testimony and discuss the fate of the megaprojects. The legislators’ general discussion neither endorsed nor suggested trying to overturn the Governor’s decisions. Testimony from the Acting DOT Commissioner included the information that $84.8 million has been spent to date on the Knik Arm Crossing including $72.9 million in federal funds. Also on January 22, 2015, the AP’s Becky Bohrer reported [ Dead link- this article is no longer online ] that the Senate Finance Committee had hired former Parnell Revenue Commissioner and KABATA Board member Angela Rodell on a 4 month, up to $100,000 contract, to provide advice on the retirement system, the gas line, and the state’s bond rating. A year ago Rodell had instigated the latest finance plan for the Bridge that proposed the state directly finance the project and testified in favor of legislation that passed committing state bonds to the project (contingent upon receipt of a federal loan that KABATA had been turned down for six times). Without the authority to incur further consultant costs, it appears that the administration cannot now pursue the letter of interest loan application. But with the legislature now in session, the final story of the Knik Bridge project may not be over yet. Reports Still Withheld: Consultants Hired for Data or Deliberations? In what may be his final action on the Knik Arm Crossing project, on November 19, 2014 Department of Transportation and Public Facilities Commissioner Patrick Kemp denied the administrative appeal of Government Hill Community Council President Stephanie Kesler’s Public Records Act request for release of the long promised socioeconomic reports (see earlier posts below) on the project. With the assistance of Assistant Attorney General David Jones and Knik Arm Crossing Project Director Judy Dougherty, Commissioner Kemp stated the reports are still incomplete and so Ms. Kesler’s June, and August 2014 PRA requests were not valid. Per the schedule announced by KABATA in mid-2013, the Cardno/Agnew::Beck socioeconomic report with new population and employment forecasts was to be a three month project which was due to complete over a year ago. State records show both Cardno and CDM Smith have been paid a total over $1.3 million by KABATA and the Department of Transportation in the past two years, so it is not clear how just “chapters” and not the entire studies were allegedly complete. What is clear is that the reports are a necessary precursor to the revised federal TIFIA loan letter of interest. Unfortunately, delay in providing those reports severely limits opportunity for the public and local officials to comment on the new population projection data, estimated toll revenue, and the resulting revised financial plan before consideration of the plan by federal officials during the TIFIA application process. The Knik Bridge project has been turned down six times for a needed federal TIFIA loan; the legislature’s commitment for state bonds and future transportation funds for what DOT&PF continues to claim will be a $894 million project, is contingent upon the receipt of an approximate $343 M federal loan. In denying the administrative appeal, the state argued that it was entitled to the “deliberative process” case law exemption from the state Public Records Act because the consultant work was in effect embedded in the state’s decision making process. Commissioner Kemp did not cite any information from existing contracts with the consultants to back up the state’s claim that the consultants were to play a part in the decision making process. Rather, the “Statement of Services” in the 2013 RFP done for the revised population projections by KABATA made clear that the chosen consultant was to produce “data” and for the consultant to present their “findings” to the Department and the legislature. When Knik Arm Crossing Project Director Judy Dougherty and the consultants present to Anchorage Metropolitan Area Solutions (AMATS) and Muni Planning and Zoning members on December 8, 2014, the public will presumably learn for the first time about the new foundational population and employment estimates for the project promised after a scathing LB&A audit came out in April, 2013. KABATA signed an agreement with AMATS in August, 2013 to provide AMATS socioeconomic data for the scheduled 2015 update by AMATS of the 2040 Long Range Transportation Plan (LRTP). Because, that data has not been shared with the Muni, AMATS has had to hire a separate consultant to produce independent revised population and traffic estimates to try to stay on schedule for the revised LRTP due to be completed in 2015. As explained in earlier posts, because the socioeconomic studies were not required to be coordinated with each other, there will now likely be three different assumptions used by the Mat-Su Borough, AMATS and DOT/KABATA for their various transportation effort. Stephanie Kesler has 30 days from the November 19, 2014 denial of administrative appeal to take the Commissioner Kemp’s decision to the state superior court. By then some of the reports information may be released at the December 8 DOT presentation and there may be a new Department of Transportation Commissioner who has a different understanding of the state Public Records Act and more willingness to share project data with the public and local officials. A column in the October 25, 2014 Alaska Dispatch News by Jamie Kenworthy - OR archived copy here - highlights the two denied Public Requests Act (click here and here) and an administrative appeal (click here) for the Department of Transportation and Public Facilities for release of the long promised reports on the socioeconomic data used to justify the Bridge. After a scathing legislative audit identifying “unreasonably optimistic” population and toll revenue projections, KABATA (Knik Arm Bridge and Toll Authority) promised a fresh start with new socioeconomic data and hired the team of Cardno/Agnew::Beck to make an independent estimate of the region’s population and employment. That new socioeconomic data was to have been completed by September 30, 2013, over a year ago, per KABATA’s own press release (click here) - OR archived copy here. That due date continues to slip: The February, 2014 KABATA newsletter [ Dead link- the KABATA website is no longer online ] promised the updated toll and revenue forecast would be available “within weeks”. The new revised socioeconomic data was to provide the background for a revised traffic and toll revenue forecast, but that report was still missing at the end of April, 2014. Thus, the legislature approved the project without having any assurance that there would be sufficient toll revenues needed to pay off the necessary state and federal bonds. The Bridge financing bill, HB 23, committed the state to fund what KABATA estimates to be an $894 million cost to build a 2 lane bridge contingent upon receipt of a $341 M federal TIFIA loan for which the state has been turned down for now six times. In this article - OR archived copy here, the Alaska Dispatch summarized the dispute over the withheld reports.The original Public Request Act (PRA) for the studies was filed by Government Hill Community Council President Stephanie Kesler on June 11, 2014 and renewed August 20, 2014, and appealed to the Commissioner of the Department of Transportation and Public Facilities (DOT/PF) on October 7, 2014. In an October 10, 2014 response to the appeal, DOT/PF acknowledged that by law the Department had 10 days but because the Assistant Attorney General who was familiar with the project was gone for two weeks, the response would likely to be delayed. From the state’s denials of the PRA request it is not clear whether the reports are complete or not. What may be likely is that the Cardno / Agnew::Beck forecast of population and employment data was completed a year ago. But Cardno, Inc may have forecasted lower numbers than necessary to pay off the bonds, so the toll and revenue consultant CDM Smith – the same firm criticized in the 2013 legislative audit – has had to model a number of new traffic scenarios to get the number high enough to show enough revenue to pay off the federal loan for which they are applying. Political skeptics may interpret the withholding of the reports for which the two consulting firms were paid over $1.3 million in FY 13 and FY 14 (click here - OR archived copy here) as being dictated by the November 4 election. However the withholding of the socioeconomic report may be driven by larger financial considerations. To get the federal TIFIA loan upon which the project depends, the project needs an “investment grade” toll and revenue forecast. To pass that financial review the state must show that there are sufficient population and traffic numbers to produce the tolls to pay off the bonds on the proposed $341 M federal loan. Consequently, hiding the data may prevent critics from questioning the state’s numbers. Interestingly, DOT/PF recently stated that, “The change in direction for how the project would be financed (ie. TIFIA and bonds) changed the type of data and increased the amount of necessary information than was originally planned under the previous P3 funding method. As a result, the contractor and subcontractors have required more time to generate the report.” That directly conflicts with the testimony provided by Rep. Mark Neuman (R-Big Lake) during the March 12, 2013 House Transportation Committee hearing on HB23, where he stated that Standard & Poor had already provided an “investment grade” rating for the project. The only gas pumps on Government Hill have now been removed by Tesoro, who apparently made the decision that it does not make business sense to upgrade the station’s gas tanks while the Department of Transportation threatens to acquire the station for the right of way for the Bridge project. The decision by Tesoro and its real estate landlord apparently caught the neighborhood, the state, and the Alaska Railroad which has a long term lease with the station’s owners off guard. Click here for the Alaska Dispatch article - OR archived copy here. On November, 15, 2013 amidst an earlier kerfuffle with the neighborhood over acquisition of neighborhood homes and businesses for a project that lacked financing, KABATA issued a press release [ Dead link- the KABATA web site is no longer online ] to highlight that the KABATA Board’s intent in “protecting the interests of the subtenants to remain in possession until construction begins.” As DOT spokeswoman Jill Reese, stated in the October 15, 2014 ADN article - OR archived copy here, “We had no intention whatsoever of not continuing their lease, and then not paying them for every bit of the relocation and expenses that they would have had.” She added that such compensation is required by federal law. On Tuesday October 14, 2014 Melinda Gant, Vice President of the Government Hill Community Council, spoke with Matt Gill, Tesoro’s External Affairs Senior Manager. Mr. Gill stated that Tesoro was in the midst of a company-wide initiative to replace their single-walled underground tanks with double-walled underground tanks. However, Tesoro received notice from Brauvin Real Estate (Tesoro’s landlord) that the lease was being transferred from the Alaska Railroad to the Alaska Department of Transportation as a part of the Knik Arm Crossing’s right-of-way acquisition process. Mr. Gill then stated that given the uncertainty cast by the Knik Arm Crossing, Tesoro could not justify the investment in the double-walled tanks. It appears that what economists call “uncertainty” has created a disincentive for Tesoro to make a long term investment in upgrading the business. While DOT’s public stance apparently commits the state to help keep a functioning local businesses alive until the Right of Way is needed, the practical effect for acquiring Right of Way before a large project is financed, discourages new investment in local businesses and leaves the neighborhood with no gas station in the interim. Discontinuance of fuel sales by the Government Hill Tesoro is a severe blow to the neighborhood, its businesses, Government Elementary School and JBER. The station was almost always busy with vehicles filling up. Neighbors, soldiers and airmen, school parents, AT&T employees, business owners, and many others used that station. The uncertainty imposed on the Government Hill Business District by the potential lease transfer has had the direct effect of lost sales at this location and a loss of economic choice by local residents and one would imagine that Tesoro would like to recoup that lost business if possible. The Government Hill Community Council is currently working with the DOT/PF and Tesoro to find a solution where the community can keep an important feature of the business district fully operational by providing the necessary “certainty” that had been taken away by DOT/PF’s pre-mature actions on Right of Way. During a site visit for potential demolition bidders on July 15th, over 50 local and city-wide protesters held signs and chanted their opposition to demolition of viable homes in the Government Hill neighborhood for an unfunded bridge. The Government Hill community is an historic residential area and the oldest neighborhood in Anchorage. On July 3rd, the Alaska Department of Transportation and Public Facilities (ADOT) announced it would remove two homes and one former business located in the path of the proposed Knik Arm Bridge even though there is no likely financing for the bridge. The 164-page Specifications document [ Dead link- this document is no longer online ] for the estimated $500,000 to $1 million demolition project is available on ADOT’s website [ Dead link- this document is no longer online ]. Following passage of HB 23, signed by the governor on June 20, ADOT took over nearly all Knik Arm Bridge and Toll Authority (KABATA) duties. This proposed demolition is the first step by ADOT to pursue the bridge in its new role. HB 23 requires the bridge to receive a low-cost federal “TIFIA” loan for one-third of its $1.6 billion cost, however, before the state can proceed with construction. KABATA has been turned down five times for a TIFIA loan, which typically goes to congested urban areas (e.g., Los Angeles, the Tappan Zee Bridge north of New York City). Anchorage Dispatch News: DOT plan to remove Government Hill homes sparks protest - OR archived copy here. Needed Right of Way? Or Demolitions to Create Facts on the Ground? Following a familiar public relations tactic to try to bury bad news by releasing it right before a long holiday weekend, around 3 PM on July 3rd, the Department of Transportation issued a press release - OR archived copy here announcing its intent to solicit bids to demolish 2 houses and the Sourdough Lodge on Government Hill. The two houses to be demolished are considered livable while the Sourdough Hotel was a functioning business until KABATA acquired the property. AKDOT has yet to acquire two other commercial properties and enter into a long term lease for land owned by the Alaska Railroad. With no financing plan in place for the project, and at least a year before right-of-way would need to be in hand, it is not clear why the state believes it necessary to demolish the structures soon for a project with an uncertain future. The KTVA report [ Dead link- this report is no longer online ] quoted Government Hills Community Council President Stephanie Kesler who noted the irony of tearing down livable housing in a city with a housing shortage. Devin Kelly’s article - OR archived copy here today in the Anchorage Daily News quoted KABATA and now DOT spokeswoman Shannon McCarthy saying it would be more expensive to secure or rent the property than to demolish them now. Those statements, even if accurate on an accounting basis, would have been irrelevant if KABATA had waited for the project to be financed before acquiring the properties.